CV Racing will be competing in the Golden Era Supersport class in the Thundersport GB Championship on the Blackbird Corporate/Delkevic Racing Yamaha R6 for the 2019 season . 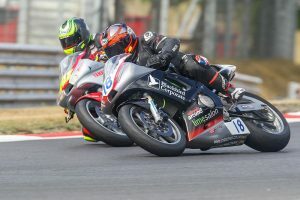 2019 is set to be a busy season competing on eight different circuits throughout the UK. Following a great 2018 season, with 5 podium finishes – 4 with No Limits and 1 with Thundersport GB. Also finishing 8th in the Thundersport GB Championship. Carl will be setting his sights on more podiums in 2019 and aiming for a top three finish in the championship.